The 1,149-foot Stratosphere Tower, the tallest freestanding observation tower in the United States, is home to Top of the World, famed for its revolving dining room and acclaimed cuisine; the highest view of the Las Vegas Strip from the Observation Deck; and thrilling attractions and rides, SkyJump Las Vegas, Big Shot, X-Scream and Insanity. 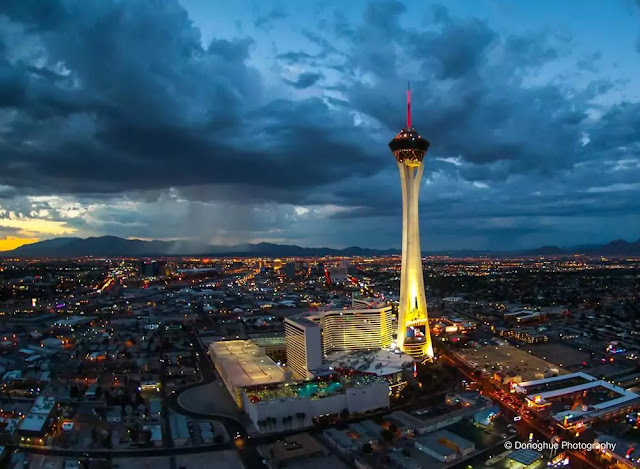 The Stratosphere Las Vegas (formerly Vegas World) is a hotel, casino, and tower located on Las Vegas Boulevard just north of the Las Vegas Strip in Las Vegas, Nevada, United States. The property's signature attraction is the 1,149 ft (350.2 m) Stratosphere Tower, the tallest freestanding observation tower in the United States.